Today mum took me to the health visitor to have some jags. I didn't cry when she gave me two jags - I am so clever. 1) Can Anna eat lumpy food? Huh? I had lasagne and chips for dinner last night - what is this woman on? 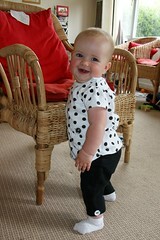 2) Can Anna sit unaided now? Sit unaided? SIT UNAIDED??? Is she barking - I've been sitting for 5 months - shouldn't she be asking if I can cruise the furniture, silly cow! ?